On October 10th I attended another course at La cocina de Babette (I've become addicted), this time on organic corns and the use of their flour in traditional baked goods in Galicia, more exactly in the Orense Province. When I saw the program I couldn't resist myself... it would include making corn empanada and bica... two of my favorite Galician delicacies! The bicas mantecadas (with butter) from Vilariño de Conso or Manzaneda... are equally tasty. 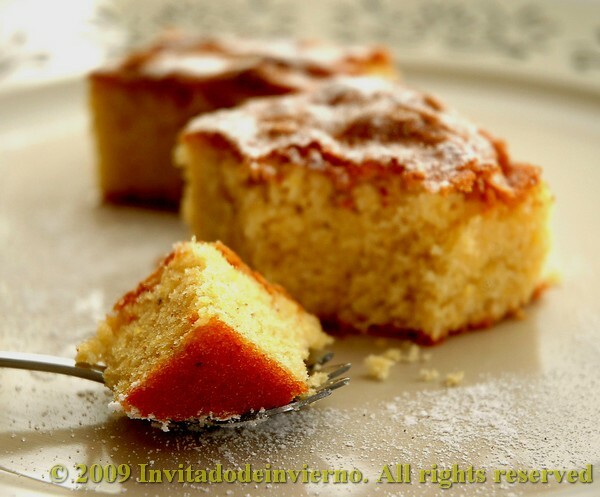 The book includes five recipes for bica, representing the various versions of this cake: yellow bicas, white (only the egg whites are used), corn, mantecadas (with butter), etc. The bica mantecada carries an oscene amount of butter and also bread dough for rising. Strong bread flour is recommended for all of them. Back to the thread again, this course of traditional baked goods made with corn flour was given by the very charming Mr. Arsenio Landa, owner of an organic farm at the Baixa Limia land. This farm is essentially dedicated to growing native corn varieties. The cultivation of these native corns has been largely abandoned in Galicia in favour of hybrid corn varieties. Besides learning about the virtues of native corn, how it is grown and how it can be used, this course had some added value. All the baked goods that we were going to prepare along the day, empanadas, pizzas, breads and the like, would be eaten for lunch at the very cooking school... I know what you're thinking... yes, all the pupils ended up conveniently stuffed, like pigs. We didn't have time to make this corn bica mantecada in the class, and Arsenio strongly recommended that we did at home, because it was delicious. And being that I am a very obedient girl, I made the bica a few days after. This makes for almost 1 kg bread dough and you only need one quarter for the bica. You can choose to divide the amounts by four or make the whole mixture and freeze it for a future use (or just use it for pizza, it's wonderful). First prepare the bread dough. Mix the yeast with the flour and then the tepid water with the salt. Make a well in the middle of the flour and pour the salted water, keeping a small amount for later. Mix by hand, Arsenio recommends this method for a better control of hydration. Knead till the dough is soft but not sticky. Add more water on the go if the dough is too stiff. Then leave it to double in bulk in an oiled bowl, covered, for around two hours depending on ambient temperature. Once the bread dough is well risen, you can really start to prepare the bica. Cream the softened butter (not melted) with the sugar, until light and fluffy (see picture). Add the eggs in two batches along with the zest and mix until thoroughly incorporated. Then add the bread dough little by little while you go on mixing. Finally add the flour mixture. Pour the mixture into a rectangular or square baking dish, well buttered and floured. 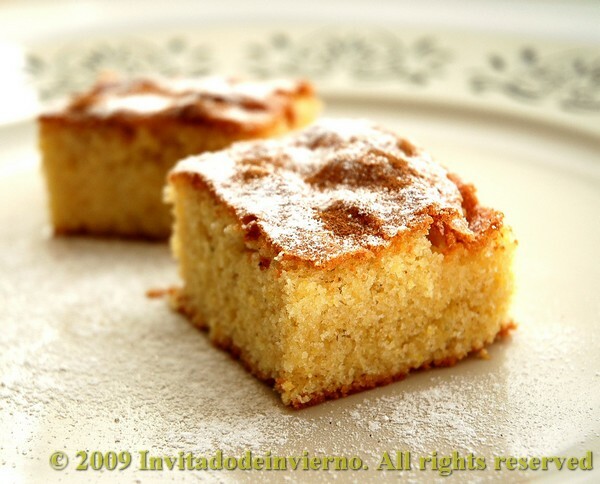 Bicas are traditionally baked in a tin. I lined the tin with some waxed paper so that the bica could be unmolded more easily. My baking dish is 35cm x 31cm approx. ; it's a bit too large for this amount of cake mixture. The bica turned out not thick enough, it is traditionally a little bit higher, but I had to get by. 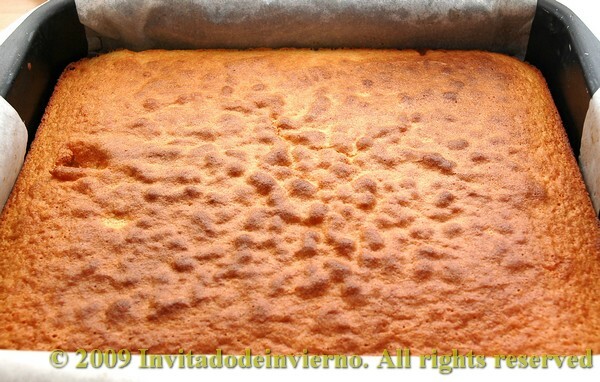 Then put the cake immediately into the oven preheated to 190ºC and bake it for half an hour. It rises very homogeneously and the surface gets very nicely browned. Check for doneness with a skewer and take it out of the oven. Then leave it to cool a little and unmold it by pulling the waxed paper. When cold, serve it in small square portions, sprinkled with powdered sugar and cinammon. I'm sending this cake to Susan's Wild Yeast, for her weekly YeastSpotting. It sounds very and delicious. Beautiful color. nothing too rich for me! looks so moist and fluffy soft. Galicia is the land of my maternal grandparents. I may have had this growing up but I don't remember it. It looks very moist. The one I love from my travels is to Spain is the Santiago (St James cake). This looks delicious. I love the golden brown color of the cake and it sounds like the perfect end to any meal. Lovely! The color and the moistness of the cake shines through. Beautiful. Miriam, Beautiful post!! Your pictures are amazing! I only wish I could have gone with you to this class :) What a fun time this must have been! Mariam, your pictures always look stunning! This recipe is something new for me. You actually made the starter dough for this cake, just like my steamed 'Ma Lai Go' recipe! Really insteresting. Cheers. Btw, corn flour is it considered as corn starch? TQ! Diana: yes, it was terrific! My Little Space: thanks! Mmmm, no, corn starch is not the same, it's just a part of the grain, corn meal should be the thing. That looks gorgeous with a really good golden color and the cake is so moist. I've never heard of anything like this. It looks delicious! Thank you for a very enlightening post. I've never heard of Bica before. Sounds and looks delicious! Madam Chow: it is delicious! Arabic Bites: I'm sure you'd like it! This sounds like my kind of cake! I never heard about such a cake before but it looks delcious. Stefanie: thanks for visiting, I'm glad you liked it!